14 Sales Automation Tools: What Should You Automate Next? My name is Lusha, and I’m here to help you become a better sales team by leveraging technology. In this page, I cover the top tools that help you automate sales activities, and more importantly, suggest what you should automate and what to focus on first. What are Sales Automation Tools? A sales automation tool can help a sales team perform day-to-day tasks more quickly and effectively, augmenting human intelligence with relevant data and insights. Sales teams perform a broad number of activities, from prospecting and discovery calls, to in-depth engagement with relevant accounts, to pipeline and performance management. Today there is a dizzying array of technologies that can help sales professionals perform all of these activities automatically, or with some machine assistance. As you’ll see below, most sales automation tools are not about replacing manual sales tasks; they are mainly about providing guidance on process, additional data, and removing tedious manual activities. By automating more of your sales activity, you can not only save time, but also become much more effective, help your reps grow professionally, and gain visibility over sales activity and performance. Sales automation does not equal CRM. You could say a CRM in a sales organization is the first stage of the automation journey. Some CRMs can do more than the basics – they might include automated prospecting and list building capabilities, integrated telephony, and more. If you have these tools as part your CRM, you’re lucky and should start leveraging them. But very likely, your CRM will not address automation for all your sales tasks. Therefore, in this post I chose to focus on additional tools beyond CRM that can automate specific sales activities. Automating prospecting – making it easier to build lists of relevant prospects. The better and faster you can do this, the more high quality opportunities you will have further down your pipeline. Arm your SDRs with machine helpers. Automating lead enrichment – obtaining rich data on prospects, such as contact information, organization hierarchy and sales intelligence. This can save time and increase the number of opportunities – tools give you more and better contact details. Sales Pipeline Management – digital systems that can help you push sales teams to new levels, by providing process management, sales analytics and powerful feedback to sales reps.
Automate scheduling – a core activity of sales is scheduling meetings, and is easy to automate. There are tools which can turn this into one click, improving rep productivity and making your team more available and responsive to customer calls. Automate emails and sales calls – relying on sales reps to manually send email follow ups, and dial to prospects relying on their memory, is a thing of the past. Modern tools tell reps exactly when they need to follow up, send emails automatically and provide data and templates to make communication more effective. These are tools that can automatically produce lists of leads, and help you make initial contact with them, based on initial criteria your sales reps provide. Automated prospecting can save time for SDR reps and improve lead quantity and quality. LinkedIn Sales Navigator is a LinkedIn product that automates sales prospecting by sifting through leads on LinkedIn and identifying relevant prospects. It provides the Lead Builder, an advanced search box that lets you filter LinkedIn users by company, job title, industry, seniority, years of experience, location and more. This can help SDRs hone in on prospects very quickly and prioritize where to invest research and calls. LinkedIn’s CRM integration allows you to pull lead data directly into tools like SalesForce and Microsoft Dynamics 365. LinkedIn Sales Navigator pricing: 30-day trial, paid plans start at $79.99 / month including 20 InMail messages and 1500 saved leads. LeadFuze is an AI-powered lead researcher that automates list building. You can provide criteria like job function or title, industry, and location, and receive double-verified email addresses, company, domain, job title and social media profiles. Data is taken from several third-party providers as well as LeadFuze’s own database. The platform also provides email automation and assists with personalizing follow-ups. LeadFuze pricing: Paid plans start at $197 / month. Lead-based pricing is also available. Datanyze analyzes a company or websites and discovers which technologies they are using. It can also provide other attributes like company size, revenue, industry, etc., as well as contact details of employees. Datanyze provides a convenient Chrome extension that gives you all this data instantly as you surf the web. This is an excellent way to find relevant accounts for your prospecting or do a “background check” on incoming leads to your website. Datanyze pricing: Free with 50 domain lookups and 10 email addresses per month. Paid plans start from $10 / month. Sales automation tools that put your sales team at a much better starting point, without having to invest any time in research. They provide emails, direct dial numbers and other rich data about prospects and the companies they work for. The sales funnel can’t operate without contact details, specifically emails and direct dial phone numbers. Our very own tool (yes, named after me 😃) can help. Lusha operates a database of hundreds of millions of business profiles and can enrich lead data with emails and direct phone numbers. Lusha finds contact details for over 90% of contacts in most industries, making it a powerful SDR tool – because often good prospects are put to the side because there’s no easy way to contact them. Lusha provides a Chrome Extension – get started in literally one minute! And also a contact API and Salesforce CRM integration for larger scale use. Lusha pricing: Free plan includes 5 emails and mobile phone numbers per month. Paid plans start at $75 per month for 100 credits. DiscoverOrg is a sales intelligence platform that provides detailed information about prospects and the organizations they work in. The platform provides organizational charts; human-verified direct dial numbers; buying triggers, such as a leadership move, an acquisition or a vendor switch; technology used by the company, and more. The platform integrates with all the popular tools in today’s marketing stack including Hubspot, Marketo, Eloqua, SalesForce Pardot and SugarCRM. DiscoverOrg pricing: Enterprise pricing on request. Your prospects use multiple social networks, and on each network, they share information that might help you close a sale. Discoverly is a browser extension that lets you look up your existing contacts in Gmail, Twitter or LinkedIn, and see what those contacts are doing on Twitter, Facebook and LinkedIn, as well as their activity on AngelList and Crunchbase. Discoverly pricing: Free! Just download the Chrome extension. These are tools that can take sales teams to the next level, with sales funnel management and actionable data that can help reps close more deals. LevelEleven is a Sales Management Platform. It gives sales leaders the tools to motivate, engage and coach sales teams. The platform provides real-time dashboards, sales contests, achievement alerts, personalized scoreboards for reps, goal management, and an early warning system for reps who fall behind. It can also help sales managers and veteran reps coach newer members of the team, by providing a snapshot of the coached rep’s KPIs, focus coaching on specific areas, and see how they improve. LevelEleven pricing: Enterprise pricing on request. InsideSales has two products that help automate the sales pipeline. One is Predictive Playbooks, an AI engine which helps teams identify, prioritize and connect with prospects using personalized sales engagement plans for calling, emailing and more. It also provides integrated telephony and email, so sales teams not only see the tasks (call John) but can actually do it within the tool (click a button to call John). The second is Predictive Pipeline, which delivers smart forecasts of sales performance, identifies what has changed in the pipeline, spots risk and helps you save deals that appear to be at risk. InsideSales pricing: Enterprise pricing on request. 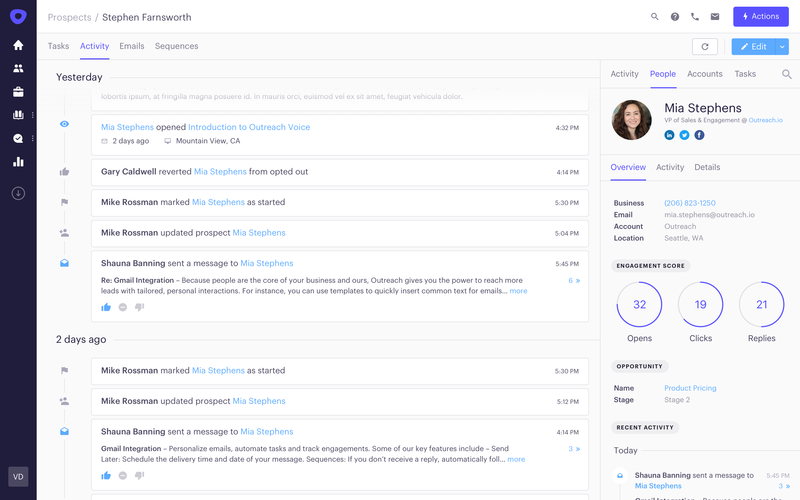 SalesLoft describes its platform as a Sales Engagement Platform. The platform is meant to be used by everyone from sales managers, through account executives, SDRs, and marketers. SalesLoft helps you set up “cadences” or workflows which define how the sales team interacts with prospects. Cadences are set into motion by SDRs or marketing and managed by sales reps. Like InsideSales, it provides integrated emails and telephony. It also provides analytics that helps management and reps understand performance and optimize the workflows with different types of prospects. SalesLoft pricing: Enterprise pricing on request. Sales automation tools that make scheduling meetings and calls a one-click activity. Calendly performs automated scheduling of meetings while avoiding the back-and-forth of multiple emails needed to find a time and place. You can connect Calendly to the calendar of an SDR or sales rep, and send a link to anyone interested in a call. They can click the link to see open slots on the calendar and schedule a meeting themselves. 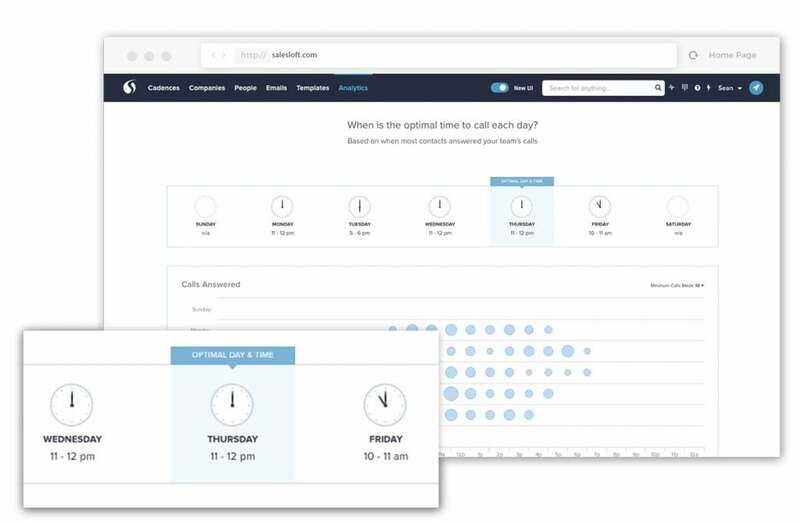 Calendly allows you to create different meeting types for different types of prospects – for example, 15-minute meetings, 30-minute meetings, meetings that can occur only on mornings or specific days, etc. Another interesting feature is round-robin calendar sharing, where new requested meetings are rotated between a team of sales reps.
Calendly pricing: Free with limited features, paid plans start at $8 per user per month. These are sales automation tools that help reps communicate with sales prospects quickly and effectively, with less administrative overhead. Assistant.to is another popular meeting scheduler which works a bit differently from Calendly – sales reps can schedule meetings by selecting several open slots on their calendar. An email is automatically composed which shows the prospect the available slots and lets them select one and schedule if the rep is still available. This is a less automated approach, which requires a bit more time and thought from the reps, but provides more flexibility and a personal touch in scheduling meetings. Assistant.to pricing: Assistant.to is free, but only supports Gmail. Outreach is an all-in-one sales automation platform that provides automated sales sequences, a sales dialer, sales emails and tracking, and automated meeting scheduling (making it appropriate for a few of our categories above, but we had to fit it into one 😃). Outreach provides sales teams with a clear “rep workflow” with predefined steps that lead to closing a sale. Execution of the different steps can be performed within the platform, which provides integrated templated emails and telephony. Outreach.io pricing: Enterprise pricing on request. YesWare promises sales teams “a follow-up strategy that just works”. It provides email scheduling, automated meeting scheduling, and email tracking. YesWare is built around Touchpoints, which define steps in the sales cycle and helps you craft automated drip campaigns, interlaced with personal emails and phone calls. YesWare pricing: Paid plans start from $12 / user / month for basic features. TenFold captures incoming and outgoing calls to and from your sales team and ensures the rep has all the relevant information on a prospect right in front of them during the call. It allows reps to make notes and add information about prospects directly in its UI, which integrates with all common CRM systems. It also captures all communications with sales prospects and provides powerful call analytics. TenFold pricing: Enterprise pricing on request. Conclusion: What Should You Automate Next with Sales Automation Tools? Automate scheduling – while this is something “small”, it’s a core activity which directly affects sales results and is the easiest to automate. Definitely start here. Automating prospecting and lead enrichment – prioritize these aspects if your main bottleneck is in SDR. In other words, if you don’t have a dedicated SDR team or it has limited resources. It is also relatively easy to automate because it integrates with your existing sales process. Sales Pipeline Management – focus here if you have already established a strong sales team, and want to push results to the next level. These tools will give you the data and optimized workflows to meet the numbers. Automate emails and sales calls – if you have a large sales team, definitely consider investing in an enterprise-grade solution that can streamline all communication with prospects. For smaller teams, consider lightweight solutions such as email tracking or templated mailers (not covered in this post – we will cover these soon :). I hope this is helpful for you as you move towards the sales stack of the future! Today I’ll discuss lead generation tools - specifically, ones that will add a lot of value to your lead gen operation but won’t cost you a buck.